Prof. Dang Huy Huynh is a senior scientist and one of Viet Nam’s leading experts on biodiversity, natural resources, and the environment. Known as one of his country’s most enduring advocates of biodiversity education, he is respected by scientists, colleagues, environmentalists and many other people who have had the opportunity to learn from his wealth of knowledge. When he helmed the Institute of Ecology and Biological Resources, he fostered the exchange of knowledge among local and foreign experts to share information and solutions in support of biodiversity conservation in Viet Nam. 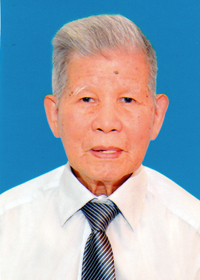 “As the leader of the Institute of Ecology and Biological Resources under the Vietnam Academy of Science and Technology during a period of 20 years, Prof. Huynh contributed a great deal to research on biodiversity of Viet Nam, presided numerous of key scientific research programs at the state level, investigated principally and participated in many regional and international cooperation projects on biodiversity, published many valuable document such as Vietnam Red Data Book, Checklist of Mammals of Vietnam, and Fauna of Vietnam,” said Dr. Nguyen Ngoc Sinh, chairman of the Vietnam Association for Conservation of Nature and Environment (VACNE). It was also under Dr. Huynh’s helm that the Institute of Ecology and Biological Resources became a leading institution in biodiversity research and natural conservation in Viet Nam. Under his leadership, staff of the institute was able to join many research programs of organizations such as BirdLife, the International Union for Conservation of Nature (IUCN), and WWF. He encouraged collaboration with foreign experts to foster the exchange of knowledge and solutions. For him, knowledge sharing will help conserve the biological resources of Viet Nam and other countries. Dr. Huynh is also known for his significant contributions to the development of strategies and policies for biodiversity conservation in Viet Nam and the ASEAN region. His work as a researcher and educator has led to the development of key pieces of legislation including the Law on Environmental Protection, the Biodiversity Law, and the Law of Forest Protection and Development. He also contributed to the development of the National Action Plan for Biodiversity. According to Dr. Phan Nguyen Hong, a researcher at the Central Institute for Natural Resources and Environmental Studies (CRES), Dr. Huynh organized biodiversity research programs in the northern border areas of Viet Nam along the Truong Son Range and in the Lower Mekong River. “Results from these researches served as a valuable foundation in proposing the establishment of transboundary nature reserves in Indochina such as Lao PDR and Cambodia where the negative impacts of human activities are still not very clear. Therefore it will be examples in the protection of nature if nature reserves in these areas are established and well managed,” he said. He added that these regions are also considered by WWP as areas with unique biodiversity that are not found in other parts of the world. Apart from his research activities, Prof. Huynh also has participated in many regional and international conferences. His reports have been highly appreciated by scientists as they contain important, truthful material about the nature and management status in Viet Nam. “Biodiversity conservation with the participation of local people is one of his most valuable suggestions. In some papers, Prof. Huynh proposed appropriate policies that are necessary to strengthen the cooperation between scientists and managers of the whole region in the control of illegal trade of threatened wildlife,” Dr. Phan Nguyen Hong said. To share his knowledge, Prof. Huynh participated in and organized training courses for biologists. He also trained communities on conservation and promotion of biodiversity resources. He organized community movements in the field of environmental protection and biodiversity conservation to encourage the greater involvement of locals in conservation initiatives. Dr. Nguyen Ngoc Sinh credits Prof. Huynh for his efforts to improve biodiversity education. “As a leading expert, Prof. Huynh has supervised dozens of doctors and masters, contributing significantly to manpower for biological sciences in Viet Nam,” he said. The well-loved scientist also raises awareness about community environmental protection and advocates the participation of local communities in strengthening conservation efforts. Prof. Huynh has raised awareness of the need to conserve indigenous knowledge in local communities. Since 2010, Prof. Huynh has led the Vietnamese Heritage Tree Event. As chairman of the Heritage Tree Council he contributed to the recognition of nearly 3,000 Heritage Trees belonging to over 100 species in 52/63 provinces and cities throughout the country. “This is a comprehensive solution to mobilize community strength to conserve biodiversity and contribute to sustainable development of the country,” Dr. Nguyen Ngoc Sinh said.